A snoot is a device for restricting the spread of light from a strobe (underwater flash) or in some cases a constant light. They come in a range of designs, you can even build your own from something as simple as the spout from a plastic bottle and some silver foil. A snoot allows you to light a small area rather than the whole of a shot. This is a big advantage when taking shots of marine animals where the appearance of the surrounding sea bed may detract from the picture. Muck diving in Indonesia is a classic example. The sand that makes up the sea floor in places like Bali or the Lembeh Straits is often an unsightly grey/black or brown. 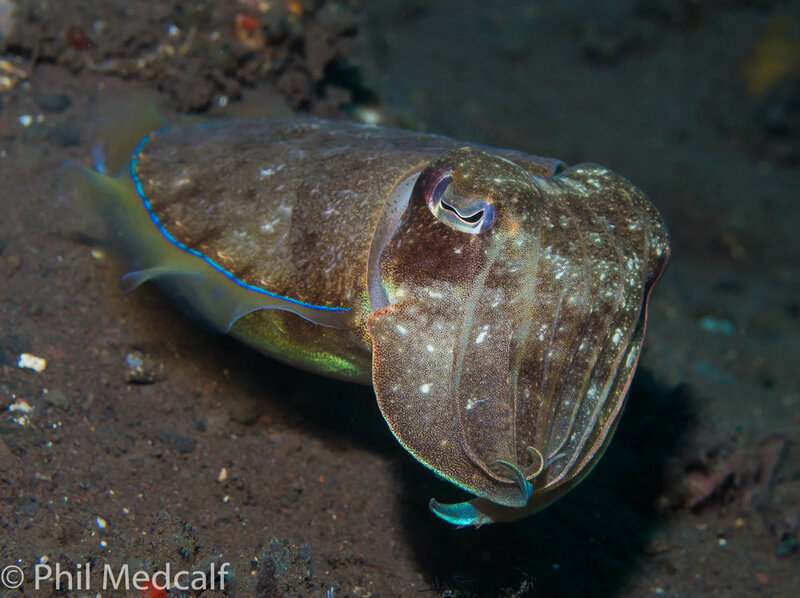 This shot of a cuttlefish taken without using a snoot shows the dark sand bottom typical of many Indonesian dive sites. The isolated patch of flash light produced by a snooted strobe allows the underwater photographer to reduce the amount of the subject's surroundings that are lit up. This helps to create images without cluttered backgrounds that would detract from the shot. 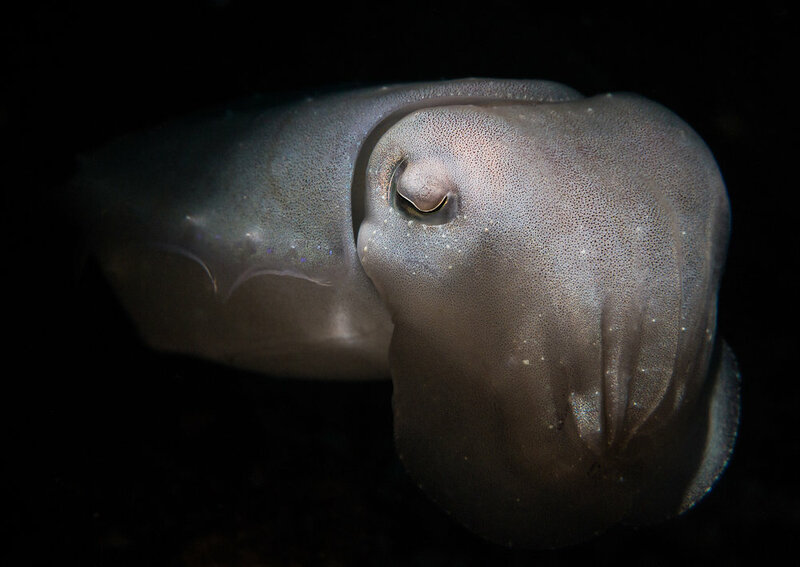 This image of cuttlefish taken by Anne shows how snooting can not only isolate the subject from its surroundings but also enhance the picture by specifically lighting the central element of the image, in this case the cuttlefish's eye. How to use a snoot? Much of it is a matter of trial and error, positioning the strobe where you think it will cast light on the subject. Then taking a shot and checking the result. Some snoots do come with LED aiming lights but these are quite expensive as snoots go. Using a snoot can be disheartening until you start getting good results. The best way to start is to choose subjects that aren't going to move away and take a lot of shots. Practicing on land is as well as underwater is a good idea. I normally use a single strobe with a snoot on it with a ball and clamp arm system. Once I find a subject I'll loosen the clamps on my arms and use my left hand to position the strobe and my right to operate the camera. Here the pool of light from the strobe was larger than the tiny goby I was taking pictures of. But the snoot kept the light confined to a quite small area which I think gave a better look to this shot than if the surroundings were fully lit. As you get more practice you'll become more conscious of where to place the strobe to light things properly. Bear in mind that the further the tip of the snoot is from your subject the wider the spread of light will be and the less light will reach the subject. Many strobes have ways of changing the size of light beam they produce. The INON kit for example has a range of different fittings. There's plenty of scope for playing around with strobes. Manufacturers have produced shaped fittings to produce pools of light in other shapes than circular. Twin snoots with two light outlets or two strobes both with snoots on can produce interesting shots such as lighting both eyes on a bigger creature such as a croccodile fish. If you feel that your macro shooting is at a point where you want to try something new, then snooting definitely creates a new challenge and can give your shots a different look. Just be warned it can seriously test your patience.